Police in Bangladesh say a pastor has survived an attempt on his life by three men who came to his home pretending to want to learn about Christianity. Siddikur Rahman, a senior police official, says 52-year-old Luke Sarker suffered minor injuries yesterday when three men aged 25-30 attacked him with a knife at his home in the northwestern district of Pabna. The incident follows fatal attacks on two foreigners last week in Bangladesh, a predominantly Muslim South Asian country that is grappling with violence claimed by hard-line Islamic groups. A pastor in Bangladesh has survived an attempt on his life by three suspected Islamists who attacked him in his house after pretending to want to learn about Christianity, days after two foreigners were killed by armed men in attacks claimed by ISIS terror group. 52-year-old Luke Sarker, the pastor of local Baptist Mission's Faith Bible Church of God, suffered injuries when three men yesterday attacked him with a knife and tried to slit his throat at his home in the northwestern district of Pabna, police said. The attackers aged 25-30 had entered the pastor's house pretending to be enthusiastic learner of Christianity. The priest said that two weeks ago the men had called him up to listen to his sermons and told him that they wanted to visit him to learn about Christianity. After they arrived at the home yesterday, the three sat for a while in the living room and then they suddenly attacked him and tried to slit his throat with a knife, the pastor said. The assailants fled from the house leaving behind their motorbike as the pastor's wife and neighbours rushed when he screamed for help, said the priest, who is also a homeopath practitioner. Meanwhile, police today arrested a 22-year-old suspect, who is affiliated with the Jamaat-e-Islami's student wing, for the attack. 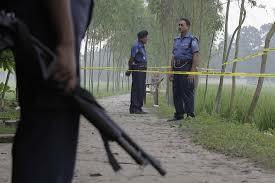 The suspect, Obaidur Rahman, was arrested this morning from Awtaparha Village in Ishwardi on a tip-off. Police had earlier said that the attackers could be members of a fundamentalist group. "We have launched an investigation. Until now it appears to be part of an effort to create political unrest," special superintendent of police's criminal investigation department Shahriar Rahman Kajol told PTI. The motorbike left by the attackers outside the house was carrying a registration number having a fake address, Kajol said. The attack on the pastor came a week after an Italian and a Japanese were killed in the country facing violence by hard-line Islamic groups. 66-year-old Japanese man Hosi Koniyo, known for philanthropic work, was shot dead in northwestern Rangpuron October 3, five days after an Italian aid worker was killed in the capital Dhaka, sparking an international uproar. The fatal attacks on the two foreigners were claimed by Islamic State militants though it was dismissed by Prime Minister Sheikh Hasina, who alleged that the Opposition BNP-Jamaat alliance had killed them to tarnish her government's image. Hasina, however, said that Bangladesh has witnessed homegrown radicalism in the past when elements like the outlawed Jamaatul Mujahideen and Harkatul Jihad al Islami emerged during the past regime of her archrival Khaleda Zia's BNP-led rightwing alliance government with fundamentalist Jamaat-e-Islami being its key partner. A senior officer at police headquarters in Dhaka said, "We do not have any proof if the three incidents were inter-related but the situation suggests that all these attacks were part of an orchestrated campaign to create instability in Bangladesh as none of the victims had any enmity to anyone." The attacks have prompted Bangladesh to enforce an unprecedented security vigil particularly in Dhaka’s Gulshan diplomatic zone and up market areas where the foreigners live.